At CorProfit we understand that sound reporting gives your board and executive committee critical information to make better informed, decisions. CorProfit has innovated an approach to reporting that cuts to the chase, providing you with the results of risk analysis to help you effectively and proactively manage risks. The collation of risks data cascades through the Risk Process and shows the risks that need most attention and controls that are best value to manage risks, which in turn gives an aggregated measure on the level of risk in different areas of your company, such as Business Plans, Departments, Projects and Assets. Each report has a purpose and is designed to address a particular part of the risk process or any analysis from it. The Reports Map sets in motion a series of reports with each providing a specific outcome and learning. The combination of these reports will provide a comprehensive and “bigger picture” analysis. CorProfit’s Modules build in the above approach to reporting and is valuable in giving you the means to integrate different Risk Programs (e.g. WHS, Projects, BCP, Compliance, etc.) and allows risks across your business to be compared on a comparable basis. 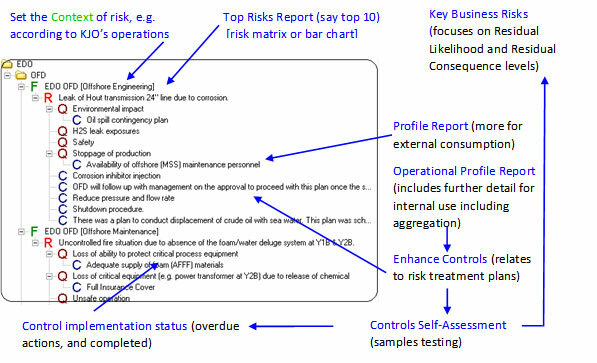 Risk Treatment Report (Action report) – showing all risks which requires additional controls to mitigate the risk.